I’ve been fascinated by water and the organisms that live in it since I was a child. When three years of sea duty made me fall in love with the ocean, I decided to pursue a degree from HSU in Environmental Resources Engineering, which I completed in 1993. Since then, my career has focused on water quality and water resources. For the past 10 years I have had the honor and privilege of being part of a team of professionals that steward some of our nations’ most spectacular public land. In this occupation I have also been witness to many environmental sins that have occurred as a result of marijuana cultivation. As a pragmatic environmentalist, it is not my job to deride marijuana or its use. But, similar to the environmental effects of logging, the problem is not necessarily that one grows pot, it’s about how one grows pot. Regardless of how one feels about marijuana and its legal status, anybody that understands just a little about aquatic ecosystems has to admit that widespread cultivation has bad consequences for fish. It degrades the quality of our rivers and streams, which to me, are the core of what makes northwest California special. In reference to one of last week’s cover stories about illegal excavation and un-engineered fill (‘Shocking’ environmental damage from outdoor grows, Eye, Jan. 18) I can attest that the additional input of sediment eroded from grow-related excavations permanently damages habitat for imperiled salmon and trout populations and undoes the benefits of millions of dollars’ worth of watershed restoration work. However, increased sedimentation is not the only or necessarily the worst environmental consequence of rapacious pot growing out in the hills. The giant hunk of failing fill is located on private land right above Bear Creek where it exits the King Range NCA could not be in a worse spot as far as fish habitat goes (notice the clear creek in the upper right corner). Recent research has shown that 80 to 90 percent of the nitrogen in coastal watersheds historically came from the ocean, much of it in the form of return runs of salmon and steelhead. However, dwindling fish populations and environmentally oblivious pot growers have turned that dynamic on its head. Now, growers dump hundreds of tons of excess fertilizer into these watersheds annually. 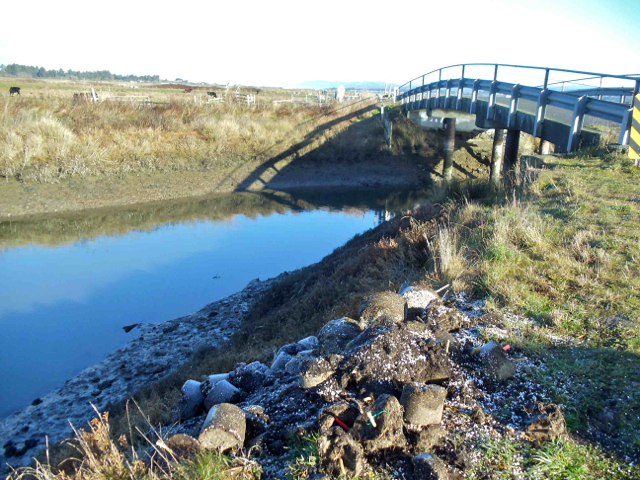 The most obvious consequence of fertilizer overuse is increased algal growth, which is most likely why toxic concentrations of blue-green algae have been observed in the Eel River in recent summers. Excessive algal growth kills fish and the organisms that they feed upon. In addition, outdoor grows frequently discharge rodenticides, insecticides and fungicides into the environment; divert springs and creeks for long distances; and leave vast quantities of trash and black poly-pipe behind. And then there are the diesel dope grows. These operations often improperly and illegally store large quantities of diesel in plastic tanks that are prone to failure. And those that do use metal tanks almost never have secondary containment and often have leaks and spills. It is worth noting that fuel distributors that dispense fuel into such tanks are also committing a felony. If anyone wants to observe the environmental consequences of petroleum spills in aquatic ecosystems, they need only to travel to an urban stream to witness the reduced abundance and diversity of invertebrate species, which are the base of most aquatic food webs. Then consider the water diversions, air and noise pollution from inefficient generators, and the random dumping of fertilizer-laden potting soil. And I can hardly bear to ponder the sad irony of burning fossil fuel to make light to grow plants in a manner that is literally 99 percent inefficient, all while it is warm and sunny outside. As long as the marijuana status quo and large profit margins remain, it appears inevitable that some of the worst crimes at marijuana gardens will be environmental ones. The citizen’s suit provision in the Clean Water Act might be a big enough hammer to change some landowners’ behavior if a motivated team of attorneys and environmental scientists were to respond to a specific incident. However, the sad fact remains that the underground economy is creating really bad consequences for the increasingly fragile ecology of our rivers and streams. But, if this letter makes only one grower reduce their fertilizer and agricultural chemical use or cause less erosion, the time it took to write it will have been well spent. This entry was posted on Saturday, January 28th, 2012 at 9:52 pm	and is filed under Opinion, Environment. You can follow any responses to this entry through the RSS 2.0 feed.